BETTER PRODUCTION MMS OCTOBER 2018 106 mmsonline.com AUTOMATION machines. When large customers visit a small shop such as MTH, risk management is always a hot topic. "When a half-billion-dollar company walks into your shop intending to have you produce parts for them, they want to know that glitches in your operations will not bring their production lines to a screeching halt," Mr. Tremain says. 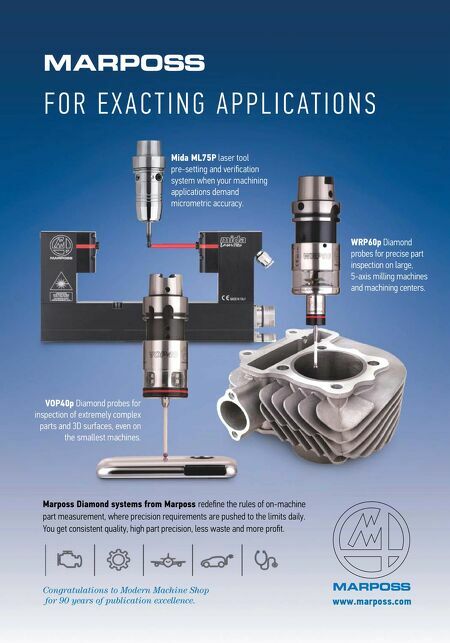 Adding Automation to Multitasking Machining Multitasking coupled with automation further intensifies the company's output and production agility. When part demand fluctuates, the Integrex machines enable the shop to easily and quickly switch over from one part to another. "These machines, in my opinion, are made for high-mix, low-volume environments, mainly because the setup times are relatively short," Mr. Tremain says. "We use customized chuck jaws and gan- try-robot grippers and plates that accommodate multiple part sizes and types. Tools don't have to change because we load each machine with all the tools it needs to run all the jobs assigned to it." In terms of job lot sizes, the shop tends to issue work orders based on a machine's auto- mation-loading-table size. Depending on the machine, those capacities can vary from multiples of 48 pieces to multiples of 36, with the median job run size amounting to 72 pieces. In many cases, the shop achieves 24 hours of continuous pro- duction from its Integrex multitasking machines, some of which have stacker-style gantries that accommodate as many as 320 of the shop's pump components at one time. Machinists will start the machines early afternoon on a Friday, and they will run unattended all through the weekend and into Monday before stopping. | Mazak Corp. 800-231-1456 mazakusa.com SIMPLE PROCESS, COMPLEX PART Still interested in multitasking machines? This shop managed to simplify its process for manufacturing a complex medical part by incorporating multitasking machines. 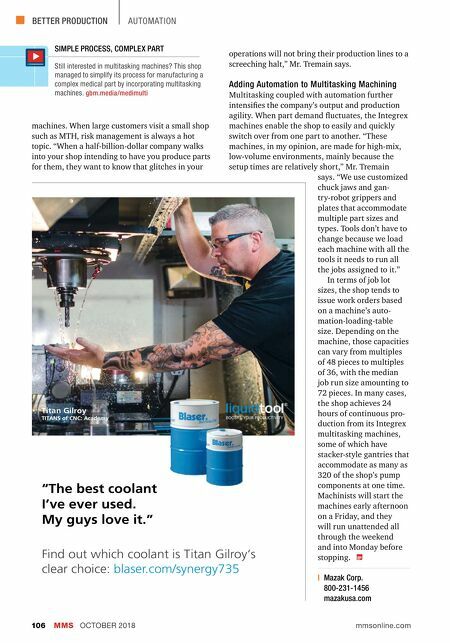 gbm.media/medimulti Find out which coolant is Titan Gilroy's clear choice: blaser.com/synergy735 Titan Gilroy TITANS of CNC: Academy "The best coolant I've ever used. My guys love it."